A wrought iron fence could be the perfect addition to your yard! Wrought Iron Fences are extremely durable and are suitable for most climates, from long, hot summers to snow and ice. Unlike wood or chain-link fencing, iron fences are solid and won’t warp or rust as quickly over time. Iron fences also don’t have nails or metal twist clips used to secure the pickets in place; the pickets and rails are welded together in large sections, so there are no small pieces that will loosen over time. Iron fences won’t crack in bends like others because they don’t bend at all. If you’d like your fence to be on an incline, it must be stepped up or down. 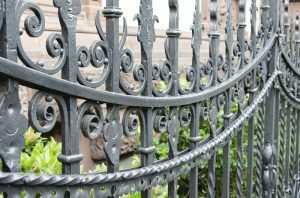 Wrought Iron fences are available in many different sizes and styles which allows you to customize your fence to meet the needs of your property. Wrought iron fences can be tall or short, used to fence in your property, as a partition, or on top of a retaining wall as a railing. If you’re looking to add a layer of security around your home, the pickets on a wrought iron fence are typically about 4 inches apart which means that intruders couldn’t squeeze through. Since the fence is welded together, the pickets are not easy to move, further protecting your yard. However, a basic design will do double duty and allow landscaping and architectural details of your home, or business, to shine through. If you’re looking to add an artistic element to your yard, there are many ways to customize your wrought iron fence. A purely decorative fence could be shorter or have intricate finials. You could even paint your fence a bright color for a modern style element–whatever matches your decor! Considering the benefits of wrought iron fencing, it is well worth the upfront investment in your property because these fences will last a lot longer than alternatives. Maintenance is necessary to keep your wrought iron fencing in good shape, but a little bit of elbow grease goes a long way. Wrought iron fences are also repairable, so there’s no need to re-install the fence on account of a little bit of damage. Having your fence professionally installed and repaired will ensure that it’s done properly, so you can enjoy your fence for as long as possible. This entry was posted on Friday, November 17th, 2017 at 5:36 pm. Both comments and pings are currently closed.